I’m excited to have the opportunity to invite my fans and followers into my home and speak to them on a more personal level. 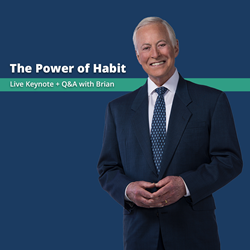 Brian Tracy, CEO of Brian Tracy International and Best-Selling Author of more than 75 books, announced on Friday that he will be hosting a live online keynote and Q&A session entitled “The Power of Habit”. Tracy, who grew up as one of four brothers in a poor family, vigorously studied and applied success strategies of some of the most influential and wealthy individuals in the world until ultimately achieving success in his career as the Chief Operating Officer (COO) for a $265 million dollar company. Since leaving his career as a COO in the early 1980s, he has become a household name and established himself as an expert on the subjects of personal, business, and sales success. He is recognized as one of America’s leading authorities and speakers on the development of human potential and personal effectiveness. The much-anticipated event “The Power of Habit: Live Keynote and Q&A” will be Tracy’s first live online event in more than 5 years. Tracy, who travels to as many as 25 countries per year delivering speeches on a variety of topics ranging from success psychology to business strategy and leadership, said the idea for the event came about after many requests from his followers on social media to host events in their countries. During the event, Tracy will discuss the step-by-step actions to take in order to develop successful habits, how to decide what habit will make the biggest impact on your success, and strategies to improve your self-discipline, self-control, and self-esteem. After the hour-long keynote, viewers will then have the opportunity to ask Tracy their specific questions on forming habits to achieve their personal goals during a 45-minute Q&A session. For more information on the event or to register to attend, visit: http://www.briantracy.com/power-of-habit-event. Brian Tracy is Chairman and CEO of Brian Tracy International, a company specializing in the training and development of individuals and organizations. Brian’s goal is to help people achieve their personal and business goals faster and easier than they ever imagined. Brian Tracy has consulted for more than 1,000 companies and addressed more than 5,000,000 people in 5,000 talks and seminars throughout the US, Canada and 75 other countries worldwide. As a keynote speaker and seminar leader, he addresses more than 250,000 people each year. For more information, visit: http://www.briantracy.com.